Today, Ben announced another grant for the 2012-13 season from The Ben Roethlisberger Foundation at The Giving Back Fund. The Foundation will be distributing a grant to the Oakland Police Department in Oakland, CA where the Steelers will play the Raiders this Sunday, September 23rd. 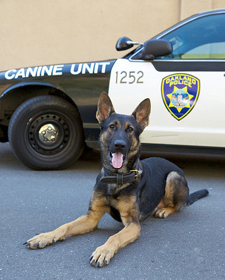 The Oakland PD K-9 unit currently consists of 14 dog teams, 12 of which are used on patrol. All are used to search and apprehend criminal suspects and two are cross trained for narcotics detection. The department is seeking financial assistance to purchase equipment that will be used by their K9 unit both in training and during deployment of the canines. This marks the sixth season that Ben’s Foundation has distributed grants to K-9 units. The mission of the Foundation is to support K-9 units of police and fire departments throughout the United States with a particular emphasis on support for service dogs in Pittsburgh, PA and to support other charitable organizations, such as the Make-A-Wish Foundation. You can read more about Ben’s foundation here. You can check out his Community page here. *The photo of “Jax” is courtesy of Mark Rogers, who has even more beautiful photography (including an awesome collection of pets) on his website. Mark is also on Facebook. *Also thank you to Louise at the Cover Your K-9 organization! This organization works with Pet Food Express and local communities in California to help provide customized bullet-proof vests, heat alarms for patrol cars, K-9 first aid kits and other specialized equipment to keep hardworking police dogs protected while they are at work protecting the public.